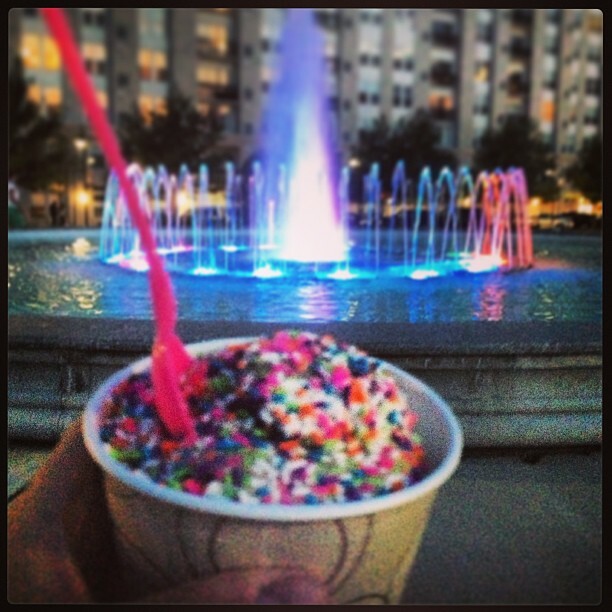 Nothing brings you back to your childhood like soft serve ice cream with rainbow sprinkles. The week I had called for exactly that; a cone, a cup, whatever, I just wanted rainbow sprinkles. It seems pretty basic, that something like that could cheer a person up, but yeah, it does. Of course, the scenery helps. Mr. Frosty’s at Harbor Point in Stamford provides an area with a park, a playground set for kids to play on, plenty of pathways for people looking to take a stroll with their dog, and a water fountain that “changes colors” and is perfect for a photo op. My companion that night, who also is childlike in her rainbow sprinkle obsession, also contributed to a good, albeit simple evening out. It was different to actually say “thank you” to someone for simply having ice cream with you, but I did because saying “thank you” is a nice compliment at times, and I doubt people ever get sick of hearing it. The ice cream was good (so were the sprinkles and childhood recapturing I got from it), so was the scenery, but to be honest it’s really the person you are with that matters most.